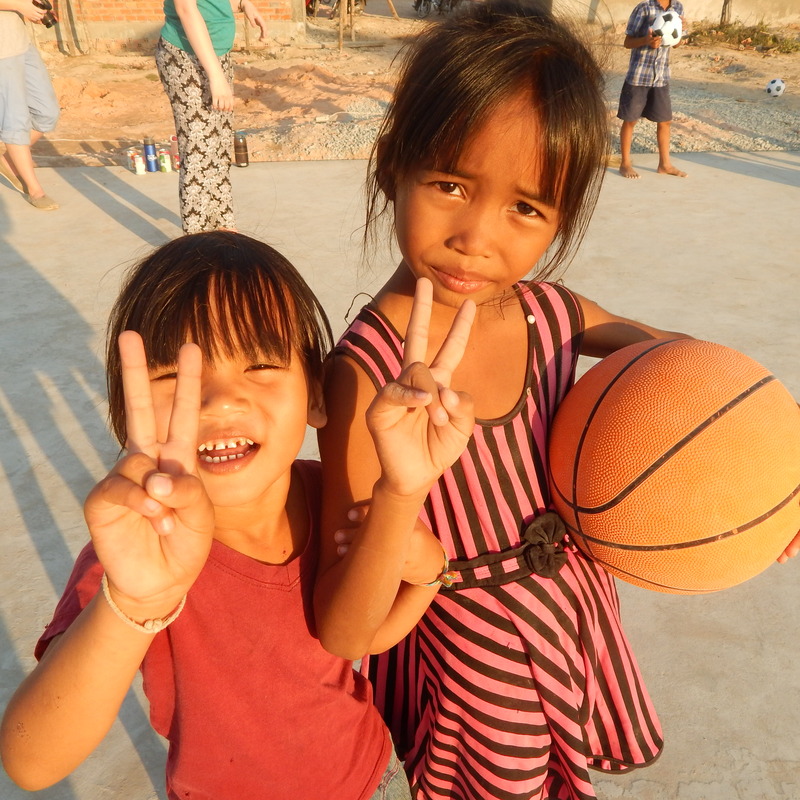 On Saturday, December 26th, 18 participants embarked on an adventure of a lifetime to build a basketball court in Cambodia. 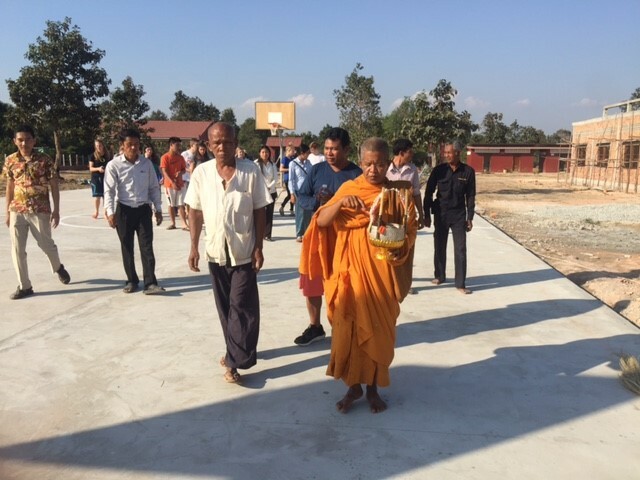 The court was built at a middle school located in Arah Sway village, about 12 km outside of Siem Reap. Although Siem Reap has a thriving tourist industry, the nearby rural communities suffer from extreme poverty and most of the 1,500+ families operate as subsistence farmers or laborers. In actual number, more than 50% of people lives off of less than 43 cents per day. Until recently, the children did not have a middle school nearby for them to attend and as a result, more than 60% were forced to discontinue their education and dropout after finishing sixth grade. 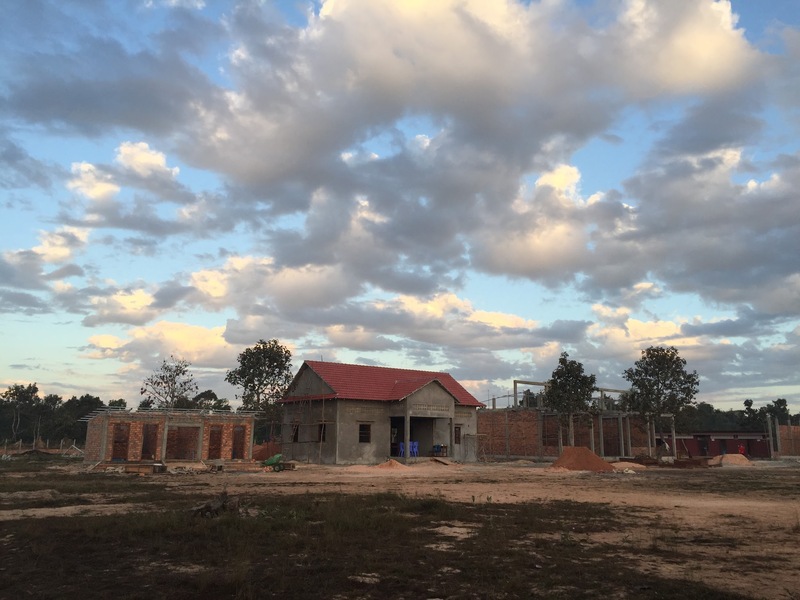 Our partner for the project, Global ADE, recently built the first middle school in the area. The court we built is located at the middle school. As the only court in the surrounding area, it will be utilized by people of all ages. 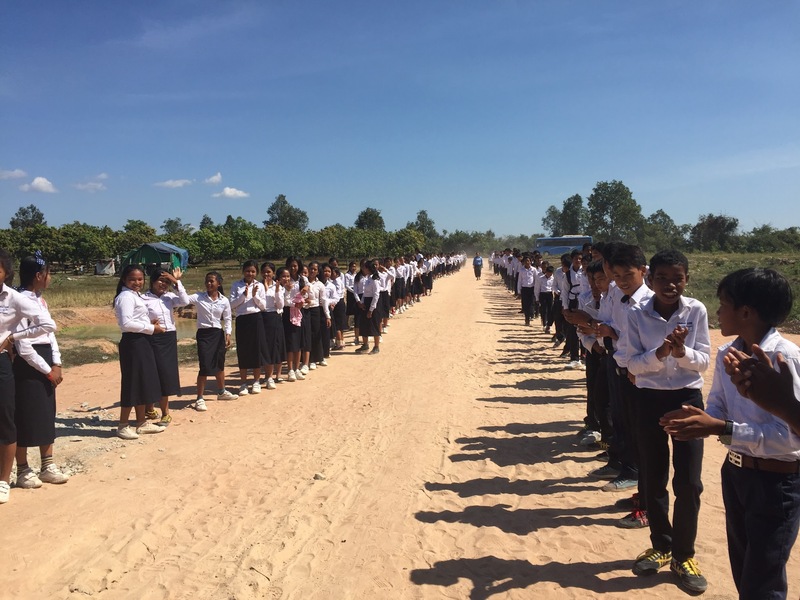 We were greeted at the school by a line of students, teachers and staff welcoming us to the school and community. We spent most of our first day settling in, meeting the students and workers and orienting ourselves to our home away from home. We rested up and were ready to start working bright and early the next day. We spent nearly four days working on the court and experienced some of the hardest work we have ever undergone in grueling heat. We worked alongside the local students, teachers, community members and workers throughout the entire process. We definitely built the court with the community and not for the community. 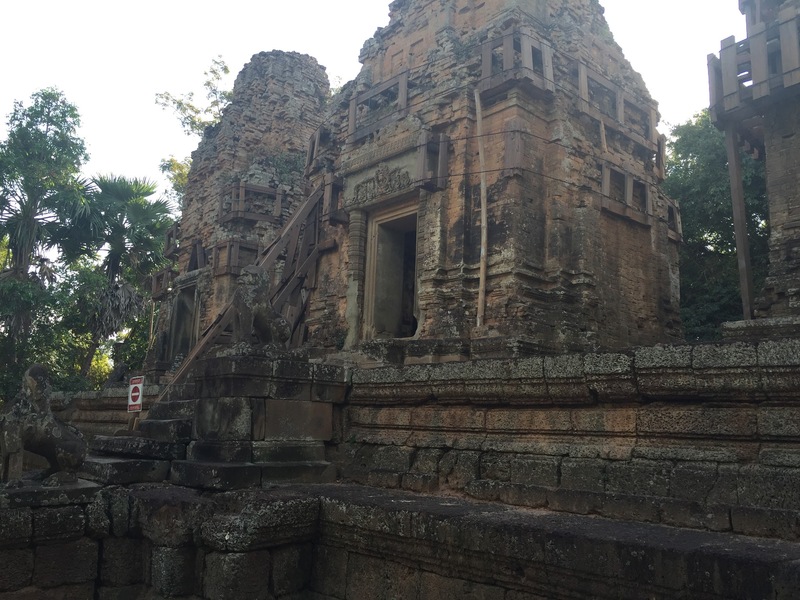 We had a once in a lifetime tour of Angkor Wat and other historic temples and learn about the history of the ancient ruins. We also got to learn about the Khmer Rouge and heard a story of survival from our in country counterpart. We also visited a killing field where bodies had been found and it is now a memorial and learning center. 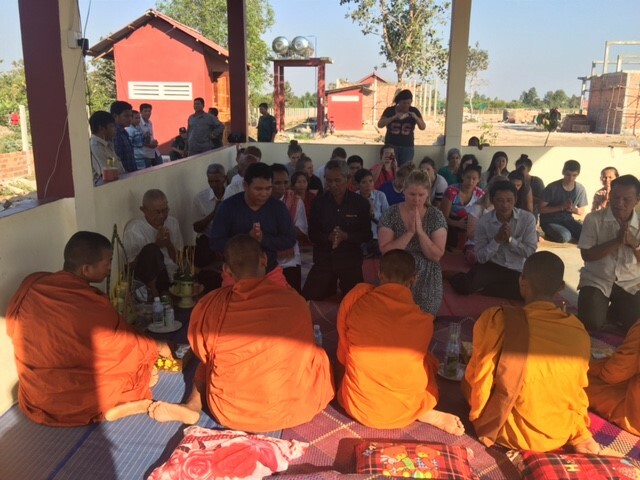 Our last day in Cambodia involved a traditional ceremony, where five local monks visited the court and conducted a blessing ceremony. 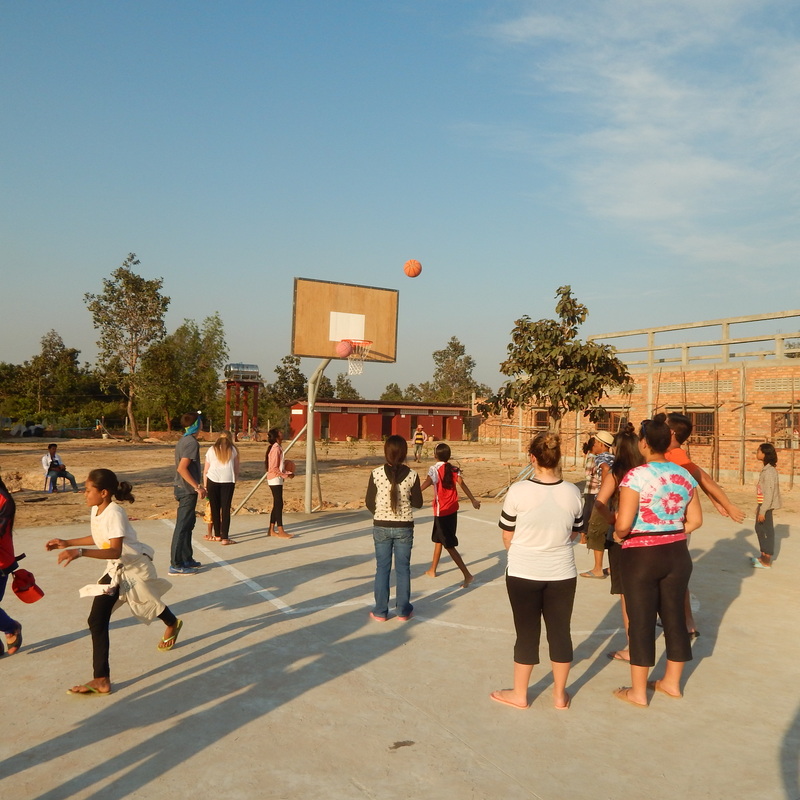 Afterwards, the volunteers played basketball with the students, community members and workers. It was an incredible moment to witness when everyone enjoyed the court together. Dinner included traditional Khmer food and music, and the group danced the night away with the community members. In addition, we learned a few Khmer dances and taught the locals a few of our dance moves. The good-byes were difficult when the group departed the school for the airport. The week was full of smiles, laughter, concrete and memories. Even with the challenges, we all left Cambodia better people. “I’ve also learned that I can do great things if I set my mind to it. When I step outside my comfort zone I begin to live in a world that’s full of excitement. I learned that I want to go home and improve my community and I can take on anything life hands to me. I now look through life with positive perspective.” – Kate M.
“The community taught me that you can and should be happy no matter what. No matter your circumstances, there is always a reason to smile. They also showed me extraordinary hard work and endurance that inspired me to keep working and give it my all.” – Isabel R.
“I admit, I do miss friends and my phone, but after seeing what these people do daily, I think about all of the things that I could live without. You might have to drag me onto the plane, because I would like to help the community in any way possible, because what they do each day.” – Alex S.
“What I learned about the world is that it is so huge and varying. Each place has its language, history and culture. Learning about the Khmer Rouge opened my eyes to what has happened in the past. It makes me want to learn and travel as much as I can.” – Katrina W.